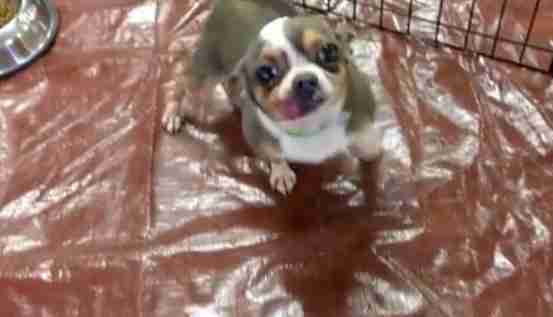 For the past nine years, Freddie the Chihuahua’s only home has been the four walls of a cramped wire cage. Locked away his entire life to be used for breeding, Freddie rarely ever went outside and never knew what it was like to have a family of his own. Year after year, he fathered hundreds of puppies he never met, until his owner wanted to get rid of him because he was too old to breed anymore. Last weekend, National Mill Dog Rescue (NMDR) took in Freddie and 34 other dogs from a puppy mill in the Midwest, where many of the United States' notorious large-scale breeding operations are located. Like most dogs rescued from mills, Freddie was very shy at first — but it wasn’t long before he was welcoming cuddles and kisses from his rescuers. His beaming personality especially shone through when Strader gave him his very first bed, a symbolic moment for many rescued mill dogs that marks the start of the many "firsts" to come. It’s bittersweet, especially for senior dogs like Freddie who have been stuck at the mills their whole lives while their puppies are sold to unsuspecting buyers online or at pet shops. “It’s heartbreaking to realize they have been denied the very basics until now,” Strader said. When she first stepped into Freddie’s pen at the rescue center, Strader placed the bed down onto the floor and the dog simply looked at it. His tail was tucked between his legs — but was wagging at the same time. She placed Freddie into the bed, and he instantly started jumping around and snuggling into it. Due to lack of dental care throughout his life, Freddie is missing all of his teeth — which made his first attempt at chewing his new bed that much more adorable. Freddie’s next step in his new life is finding a home, but the staff can tell it won’t be long. 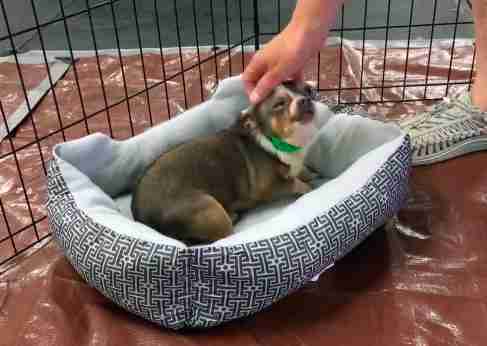 Since the rescue shared the video of him enjoying his new bed, people have already begun applying to adopt him. 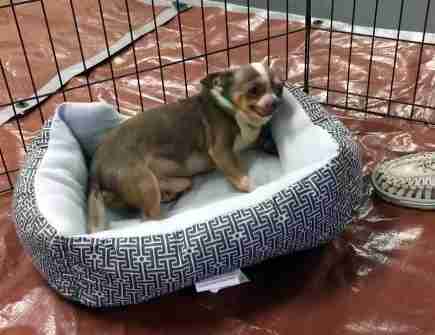 But until then, you can find Freddie happily nestled in his little bed, flashing that sweet toothless grin at anyone he meets. To help more dogs escape puppy mills, you can make a donation to National Mill Dog Rescue. You can also take a pledge against puppy mills and donate to investigations that help shut them down.